Okay so I got here Wednesday January, 11th. The flight was rough because obviously I didn’t sleep and everyone else did. For those of you readers that are unaware, I have some sleeping issues. 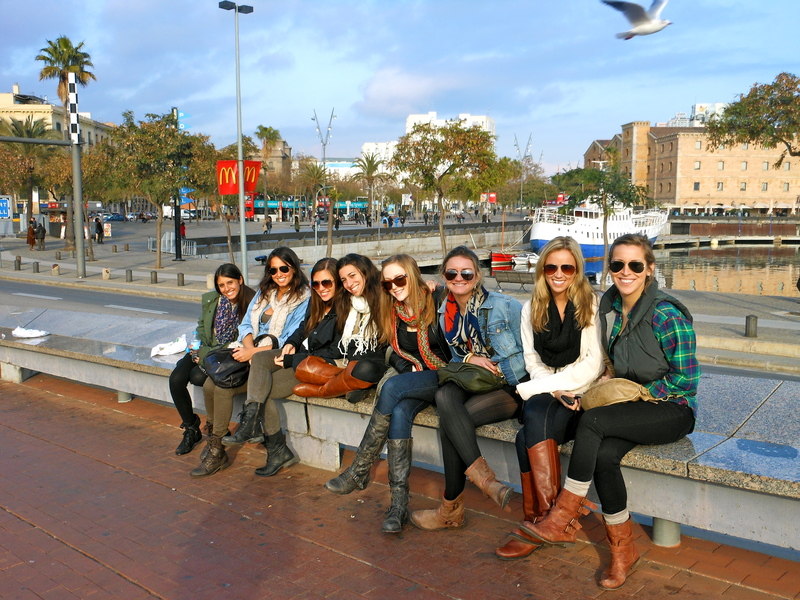 When we got to Barcelona, Jill and I had to wait a couple hours for Susie and Ilana to get there. When they got here we were picked up and driven to our apt. Sightseeing on the way was amazing. The buildings here are actually beautiful. We live in the gothic area and so it’s old Barcelona. When we got to the apartment I was overwhelmed by how beautiful it was!! The only scary thing is it’s down an alleyway. I thought it would be scary at night but it wasn’t when Jill and I got home at 5:00 am last night (but really this morning). We have our own elevator that goes right to our apt.- Gossip Girl style. Jill and I are sharing a room. Ilana and Sarah and Susie got her own room because Shana didn’t end up coming. I love all of my roommates! After we got settled into our apartment we were taken on a tour of our neighborhood by Kristina. She is kind of our landlord but we call her our house-mom. She showed us all the farmacia’s, grocery stores, restaurants, banks etc. in our area. 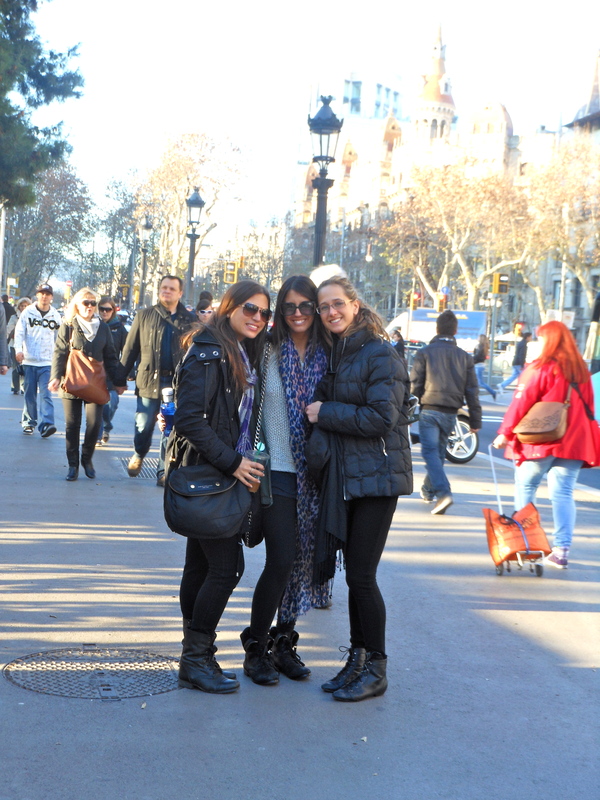 We are really close to the main street called Las Ramblas. It is an amazing street with so much life. It has a gazillion restaurants, marketplaces, stores, street performers, etc. We went to this restaurant with tapas. Tapas are the main dish here and what we ate was kind of gross. It was bread with a bunch of fish on top. Kind of made me nauseous. After that we got drawers to unpack our clothing into and extra keys made. Waking up for orientation after my first night out was a struggle but we went and we really didn’t need to. We shall see. I slept when I got home from orientation. 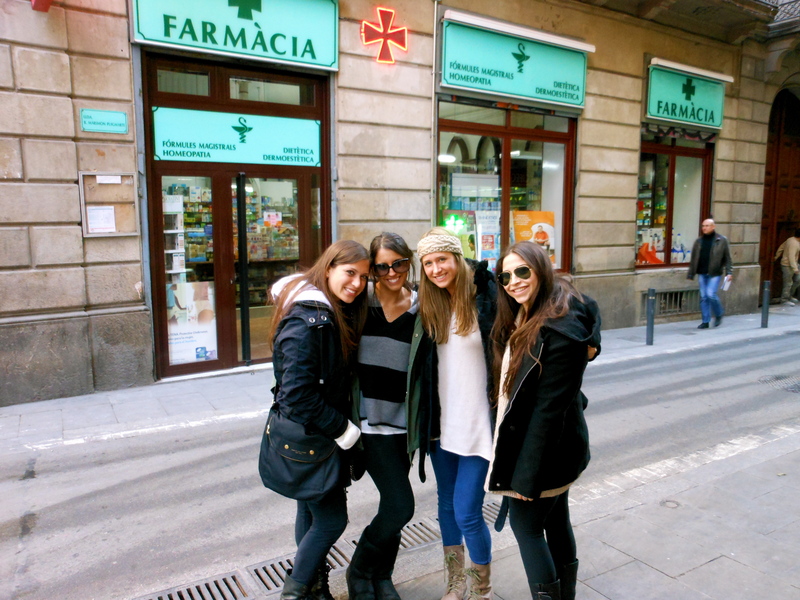 I don’t want to be hungover everyday because I want to see Barcelona and experience it. I want to take in all the sights. I had an excuse though, I am still pretty jetlagged and anytime I can sleep I should take full advantage. A few of the things I have noticed since I got here are that everyone rides around on mopeds and motorcycles, the people are super friends and the majority of the people speak at least a little english. The second day of our trip, Jill and I wanted to meet Hannah Aaronson for lunch. She recommended this restaurant called Bo De B which is supposed to be amazing. We looked up the address and hoped in a cab. It ended up being a 30 second walk away from our apartment. Very embarrassing!! It was a little hole in the wall but it was really great. After that we went to Parc Guell. It was actually an amazing sight to see. It was built by Antoni Gaudi who was a famous architect in Barcelona. He built a lot of the gorgeous buildings here. It looks similar to Disney World. You walk to the top and see a beautiful view of Barcelona. The day after we walked around to try and get the hang of the city. We went to Cathedral de Barcelona which is a beautiful church. It is really close to our apartment! It is where the Archbishop of Barcelona sits. It is crazy how old these buildings are. The ceiling inside the church is amazingly beautiful. We got really lucky with the location of our apartment. It is a 5 minute walk from the beach and is also a 20 minute walk from school (CEA). Our area is really cool. We live in Barrio Gotico which is the old city. It has a lot of cute boutiques, restaurants and bars. It is a maize though. It is very easy to get lost in it. I am taking Fashion: A Mirror of Our Times, Journalism 2.0, Global Competence, and Photojournalism. I love all my classes. I couldn’t have asked for a better schedule or better classes.